With an attractive wheelhouse, the Barracuda 7 sport fishing boat combines comfort and speed and will take you anywhere on water safely. With a top speed of 35 knots, this seaworthy boat is easy to use and drive to wherever the shoals of fish are located. This sport fishing boat has a Scandinavian-style central wheelhouse surrounded by a very safe walkaround. 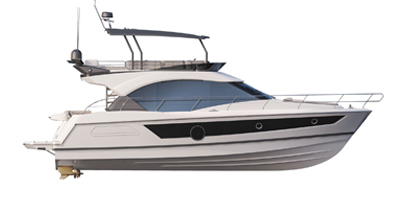 With a straight wheelhouse, streamlined v-flared hull, powerful and energetic lines, the Barracuda 7 has excellent sea-keeping and is easy to handle. Extremely open, its cockpit and foredeck make the most of living spaces. Inside, the Barracuda 7 favors comfort when cruising. The two side doors on the wheelhouse ventilate the boat well and make movement on board easier. The driver’s bolster seat, a control panel ready to receive a full range of electronic equipment, and 360° visibility contribute to her safety and the pleasure of driving. The small galley, double berth and independent heads reveal a level of accommodation unusual on this type of outboarder. The mahogany woodwork matches the laminated parquet floor perfectly, as well as the soft tones of the upholstery, making the atmosphere warm and cozy. Resolutely seaworthy, the Barracuda 7 combines intelligent design and power for memorable trips. Whether for fishing or diving trips, or just lying in the sun, she is always ready to make the sea your playground. The Barracuda 7’s large planing hull was studied specifically to optimize performance and maintain good stability. With an outboard engine of up to 200 HP, her cruising speed is 25 knots reaching 35 knots at top speed. She has easy access through two side doors and the wheelhouse walkaround makes movement on deck easy and safe, while giving you a feeling of space. The huge well-opened cockpit offers nearly 43 sq ft of practical space where you can relax. The variety of equipment provided for fishing and cruising mean that the Barracuda 7 can be adapted to the main programme. For fishing: Full Lowrance electronics, rod holders, side net roller, deck wash pump, deck searchlight, and live-bait well. For relaxation and comfort: swim platform, sunbathing area, cockpit seat and table, sun awning, small galley and air-conditioning.